The Manhattan Skyline is incredible viewed from Hoboken. 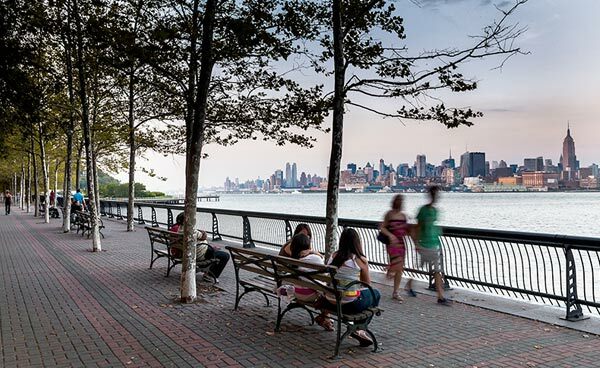 With it's majestic sweep of the Hudson River, train terminals, piers, historic streets and architecture you will love sketching Hoboken's many views. Lunch: 12 - Noon: Picnic Style, bring your own or pickup a bite in the numerous shops and stores. Afternoon: 1:15 - Back to Sketching. We'll move along the path of the map - across Sinatra Drive, up 4th Street then back using Washington Street. Sketch at will as you go. Show and Tell: We'll finish up at the The Dubliner, 96 River St at the corner of 1st Street to share drawings, good stories and a beer or wine if you're so inclined.